My husband and I visited the USS Arizona Memorial at Pearl Harbor, this week. I couldn’t help but relate the events of December, 7, 1941 to those of September 11, 2001. Listening to the stories of the people who were suddenly under fire from an enemy from the sky, who saw friends and family shot and bombed, was almost too much to bear. The sight of the Arizona underwater, where all those men died without warning when bombed and their ammunition supplies blew up, reminds us that there are men who will kill, without warning, for power. The source of that picture is here. The museum at the Park has a series of videos telling the story of Pearl Harbor and World War II, and a movie that everyone watches on the way to the shuttle boats that take you to the Memorial. 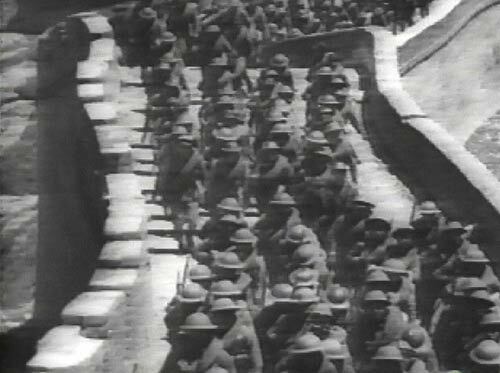 Since there’s been so much talk lately about building a wall along the Texas-Mexico border, one particular image caught my eye: movie footage from the early 1930’s, showing Japanese troops marching on the Great Wall of China. I thought it was propaganda from the war department, but no, it really happened. See more about the First Battle of Hebei or Operation Nekka, here. It wasn’t for lack of a wall that China lost much of her land to Japan. It was the lack of men and materials to defend the wall. We already have Mr. Cain’s “moat,” although without the alligators. It’s called the Rio Grande. Our farmers and ranchers along the Rio have water rights that allow them to make a living and grow food for Texas and the United States. The fence makes it harder and more expensive for them to do their jobs and does nothing to stop illegal aliens and drug runners from coming into the US, because our Border Patrol agents are too few and far between to respond and apprehend criminals, even when alerted. The fence only works where there are frequent patrols and response from near by. It does not work if there’s no one to respond to breaches. A fence is straight, the river curves back and forth. So, the Feds build it inside the border, not on the border, giving up land that is U.S. soil. In the meantime, they cut off homes from the rest of the State, they deprive Texas farmers and ranchers their rightful access to their own property and to their water rights. This not only leaves wide swaths of the United States outside of normal defense, it makes it more expensive to run the farms, the ranches, and even regular households. The next time you hear someone say that we need a fence along the Rio Grande, I hope you remember the Great Wall of China. We need men and materials to defend our border, not a wall between Texas and the Rio Grande. Read more about the border, here. Asiatic and Nipponese representatives met in the Tanggu regularise of Metropolis turn on 22 May 1933 in an pioneer to end the undeclared war between Prc and Nippon.